Our unprecedented performographics identify and rank every institution’s profit, growth and risk opportunities, summarized as primary themes or detailed as individual components. Once you’ve generated your target list, filter and segment prospects by firmographics (i.e. FI type, size, or geography) to focus campaigns on the highest probability FI segments. Get unparalleled insight into the technologies and digital offerings deployed by all U.S. financial institutions. Understand their buying habits, integration constraints, vendor diversity, and next-most-likely solutions. Search for institutions that have (or don’t have) specific retail, business or operating solutions from a hierarchy of nearly 100 solution categories. 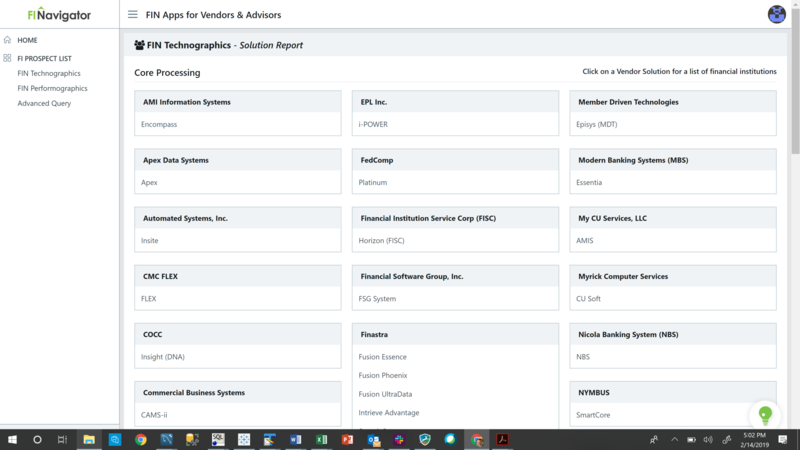 Or search for specific vendor/products critical to your solution’s integration (ex. core processing) or where your solution matches up favorably. Our not-seen-elsewhere performographics are your window into every institution’s profit, growth and risk opportunities, summarized as primary themes or detailed as individual components. Find existing performance or offering pain points that align with your solution. 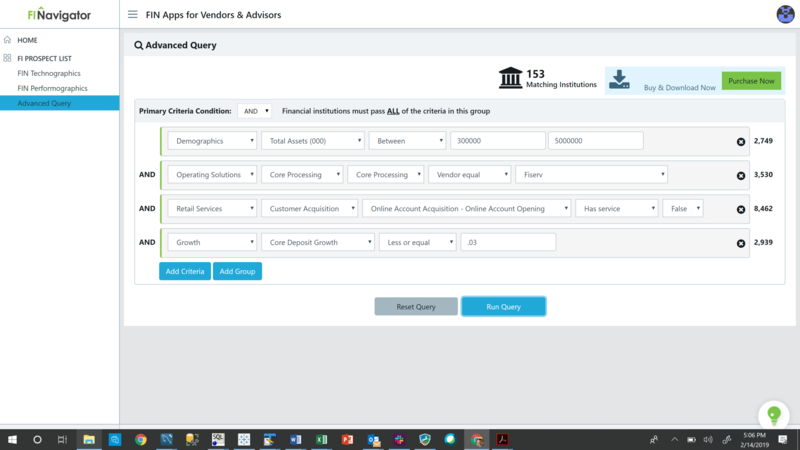 For example, identify institutions with a primary opportunity theme of core funding that don’t currently deploy an online account opening solution. Then filter the results by institution type or size. 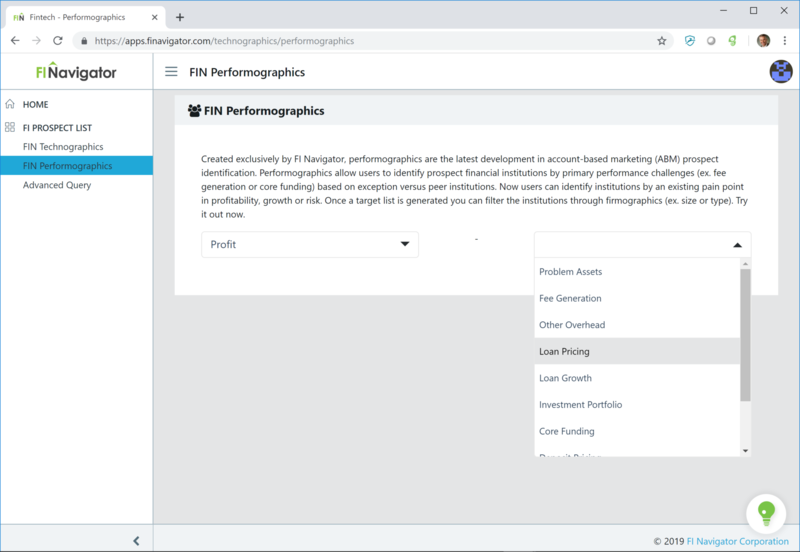 Deploy our advanced FIN Query to harness the powerful combination of technographics, performographics and firmographics for the most precise FI prospecting available anywhere. Design a query that will precisely identify those institutions where your product is a solution to an existing performance and/or offering deficiency filtered by institution type, size, geography or other firmographic variables.